We have learned that you can save a LOT of money by renting a car anywhere in Phoenix EXCEPT at the airport. Even if you have to hire a taxi to get to your rental car, it will probably be cheaper than renting at the “airport” (airport car rentals are all centralized off-site and a shuttle ride is required to actually get your car) where higher rates in general and special fees quickly add up. But you don’t have to use a taxi either. The Sky Train that serves Phoenix Sky Harbor International Airport connects almost seamlessly with the Valley Metro light rail system. With a bit of planning you can avoid renting a car at the airport and – maybe – avoid renting a car at all! 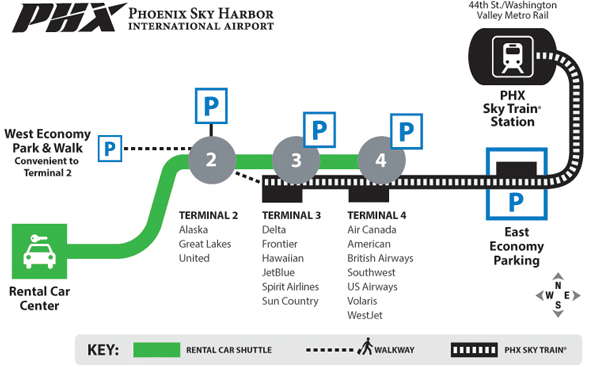 Phoenix Sky Harbor International Airport provides free train service from all airport terminals to the 44th Street Transit Station via the Sky Train. 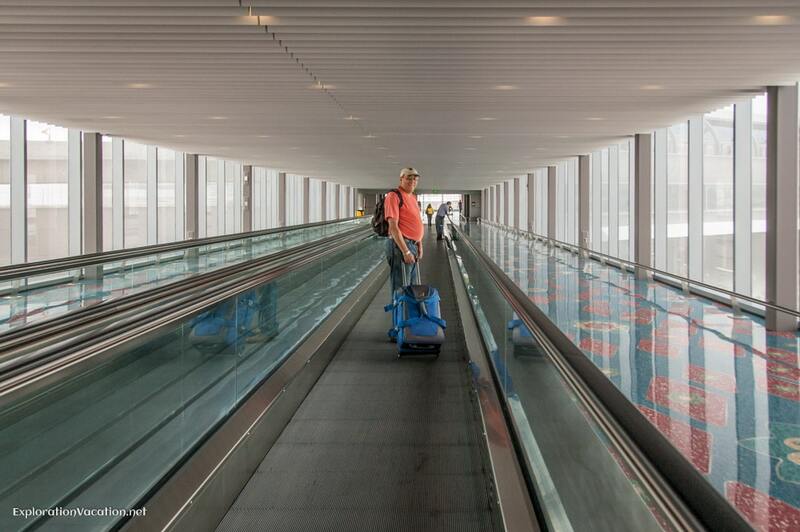 Travelers arriving at Sky Harbor can access the Sky Train on the same level as the gates and security checkpoints. Last year we had to cross a long (but lovely) walkway (with moving sidewalks) to get from our terminal to the Sky Train, but the train now stops at all but Terminal 2, which should eliminate or significantly reduce that walk for all travelers. The Sky Train uses the upper level of what is, in effect, the 44th Street station. It’s an odd configuration to look at from outside, but it’s easy to use: take the escalator down to get to the Metro rail platform or up to get to the Sky Train platform. Unfortunately there are no facilities at or near the 44th Street Station. That means there isn’t a taxi stand and the nearest rental car office is about a 20 minute walk through an exposed and not very welcoming area. Because there is nothing at the 44th Street Station, plan to connect to Valley Metro’s light rail or bus system here. Be sure to purchase your ticket ($2 will get you to wherever you need to go) from one of the ticket kiosks on the platform before you board the train. The Sky Train runs every three to four minutes, 24-hours a day, 365 day a year. 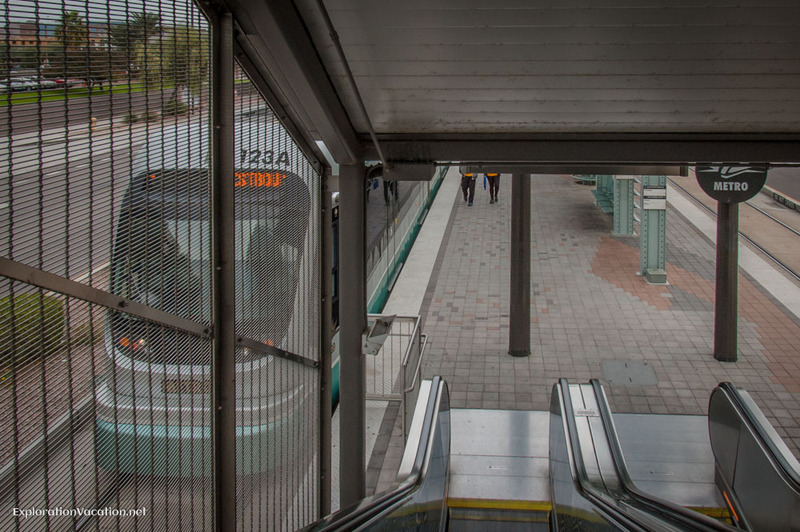 However, Valley Metro light rail runs on a schedule that should accommodate most fliers, but it does not run around the clock, so check arrival and departure times carefully if you plan to use the light rail. While only a limited number of destinations can be reached via Valley Metro’s single rail line, it provides good coverage in the city of Phoenix itself and can be a great way to get around. It’s particularly useful downtown, since you can leave your car at a park and ride lot and spend the day in the city without the cost and hassle that goes along with parking in the city. Valley Metro has a very useful map showing the light rail route in relation to area attractions. Raillife provides links to Valley Metro Light Rail maps that show train stops along with nearby hotels and places to get a drink. Of course, the train can also be used to connect to Phoenix Sky Harbor airport via the Sky Train. As noted above, that connection is at the 44th Street Transit Station. See, it really is possible to visit Phoenix without a car! This isn’t an endorsement of these agencies, just a list of the options. The only one I’ve used is the Hertz that is moving to a location near the 7th Avenue/Camelback station. (It is currently on Indian School Road.) I would definitely use them again if we stay in that part of the city. However, we usually head to the east side of the valley, so next time we’ll probably try the Hertz or Dollar near the Sycamore/Main Street station in Mesa. Train station locations are clearly marked. All have ticket machines on the platform and some have park-and-ride lots. Many, but not all, are in commercial areas where a variety of services are available. 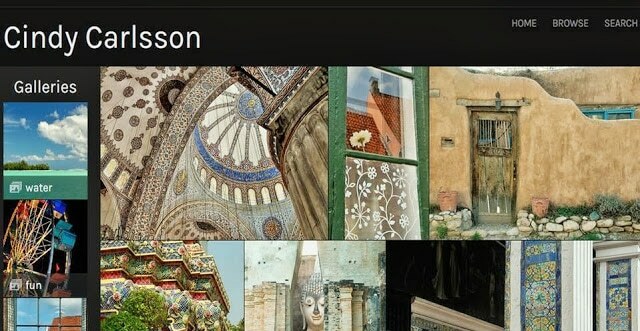 All have artistic elements and provide at least a little shelter from the sun. Valley Metro light rail trains run from approximately 4:30 am to 1:00 am, but not all stations are served for that entire time period. They do NOT run around the clock like the Sky Train, so always check the hours of operation for your specific stop! When trains are running, the longest you should ever have to wait is 20 minutes. During peak periods, trains generally run about every 12 minutes. 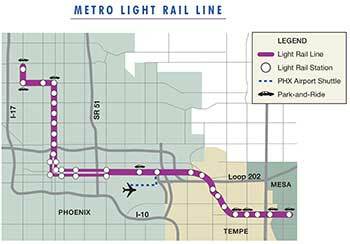 Light rail fares are $2 per ride or $4 for an all-day pass. The all-day pass is a great value, as it lets you hop on and off the train as many times as you like. I’ll look for you next time I’m on the train in Phoenix! Thanks for sharing, we prefer to avoid the rental car when we can. I like that transit can lead you to interesting new places you wouldn’t have known about otherwise AND save money. Thanks for stopping by!